Ben Carson is not only a gifted surgeon, he is a wonderful writer – funny, interesting and this book is exceptionally difficult to put down. Even the descriptions of brain surgery, which should be nothing but gross, had my complete attention because they were phrased in such a way that made them interesting but not at all gross or disgusting. And the stories about Dr. Carson’s mother… WOW! No wonder he is such an intelligent and learned man – she is clearly a GENIUS! I refuse to spoil the book for you but please take my word for it – it is a FANTASTIC book! A MUST READ! And not just for teens either… parents will get so much out of this book too! You Have a Brain: A Teen’s Guide to T.H.I.N.K. B.I.G. by Ben Carson MD – Tweet this! You have a brain… but do you know how to use it? – Tweet this! Throughout his life, renowned neurosurgeon Dr. Benjamin Carson has needed to overcome many obstacles: His father leaving the family; being considered stupid by his classmates in grade school; growing up in inner-city Detroit; and having a violent temper. But Dr. Carson didn’t let his circumstances control him, and instead discovered eight principles that helped shape his future. 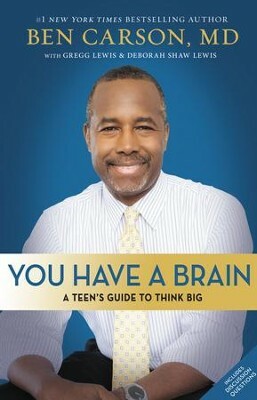 In You Have a Brain: A Teen’s Guide to Think Big, Dr. Carson unpacks the eight important parts of Thinking Big–Talent, Honesty, Insight, being Nice, Knowledge, Books, In-Depth learning, and God–and presents the stories of people who demonstrated those things in his life. By applying the idea of T.H.I.N.K. B.I.G. to your life, and by looking at those around you as well, you too can overcome obstacles and work toward achieving your dreams. Disclaimer: I received this book free in exchange for an honest review.